Best Friends is an ultra-cute 3D platform game where you help the 2 friends, Petey and Patty, reunite with each other. Each board is totally unique, almost like its own little game. Try not to fall as the boards twist, turn, and slide. The Japanese inspired cartoon graphics and whimsical speech sounds contribute to the fun. At only 4 megs, it's a quick download, even on a modem. 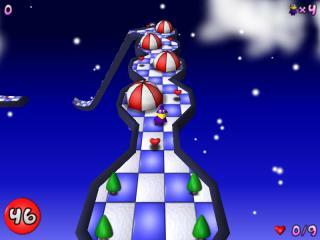 Help Petey and Patty reunite in the ultra-cute 3D plat former! Best Phone is a SIP based VoIP soft phone integrating SIP stack, Java and JMF. Compare prices from mySimon DealTime CNET PriceWatch etc. simultaneously! Best Reader, the computer-based system for mastering speed reading skills. Dip into a world of holiday delights, treasures. Best stress relief browser toolbar for Internet Explorer. Best and New books, you can check easly all book on the net. Game collection with 80 best flash games. Qweas is providing links to Best Friends 1.03h as a courtesy, and makes no representations regarding Best Friends or any other applications or any information related thereto. Any questions, complaints or claims regarding this application Best Friends 1.03h must be directed to the appropriate software vendor. You may click the publisher link of Best Friends on the top of this page to get more details about the vendor.